EIRR 3503 and 3508 lays down the sand, draging a 50 car grain train from the General Mills plant, into the Idaho Falls yard. EIRR 3503 and 3508 by the old stations site, lugging a 50 car grain train from General Mills. EIRR 3503 heads to Ammon Idaho with hoppers for the pumice mine loadout. The Idaho Falls Turn cuts off of it's train at sunset, at the north end of the Idaho Falls yard. In the foreground is the EIRR northern section home base. Bangor & Aroostook 357 has come to work for EIRR in the Idaho Falls area. Start work for 357 was reportedly on 10-6-02, and was photographed here on 10-10, just in time for spud season. EIRR 3503 spots hoppers at the pumice mine loadout in Ammon, Idaho. Switching the General Mills elevator complex in Idaho Falls on the old main. Eastern Idaho Railroad's ex-Conrail 2242 and 3503 switch the Idaho Falls yard. Back to the home base after a run up north to Rexburg. 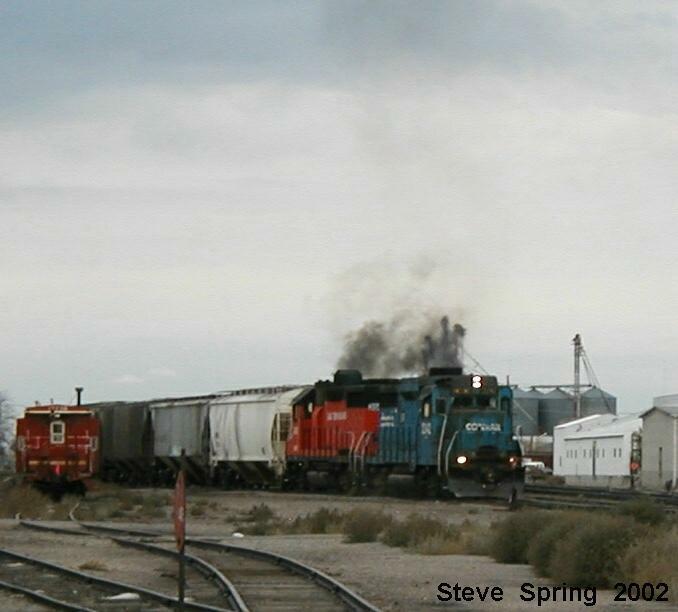 EIRR locos laying out a smoke screen in the Idaho Falls yard. 3508 and 2242 switching spud house Idaho Supreme in Idaho Falls, on the old main. 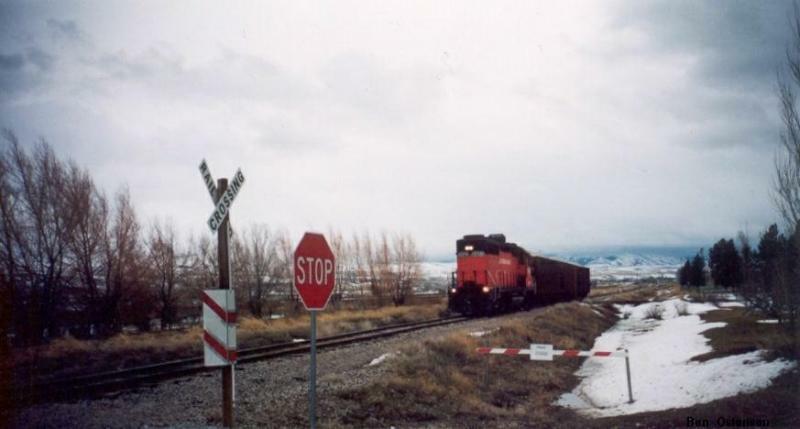 The Eastern Idaho Railroad started running on November 21, 1993, as a collection of two disconnected clusters of former Union Pacific branches. EIRR is owned by Watco, Inc (WAMX), of Pittsburg, Kansas, a short line operater. 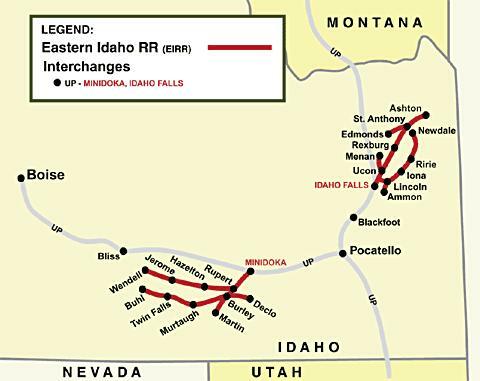 EIRR operates two segments, that move more than 35,000 carloads per year to the Union Pacific, with interchanges at Idaho Falls on the Northern Segment, and Minidoka on the Southern segment. The annual income is reported as being under 25 million dollars. the Oakley Industrial Lead (Burley to Martin, 11 miles). All lines connect for a total of 152 miles. Operations are based out of the ex-UP depots at Twin Falls and Rupert. The southern segment interchanges with U.P. at Minidoka, ID. Silver Bowl bound UP with 7 MRL locos headed out of the Idaho Falls yard, while EIRR locos idle in the foreground. the West Belt Industrial Lead (Ucon to Menan, 10 miles). All lines connect for a total of 119 miles, served by four locomotives, with operations based out of an office trailer on the north end of the Idaho Falls yard, the point at which EIRR interchanges with UP's montana sub. BAR 357 switches a potato packing plant in Ucon, Idaho. 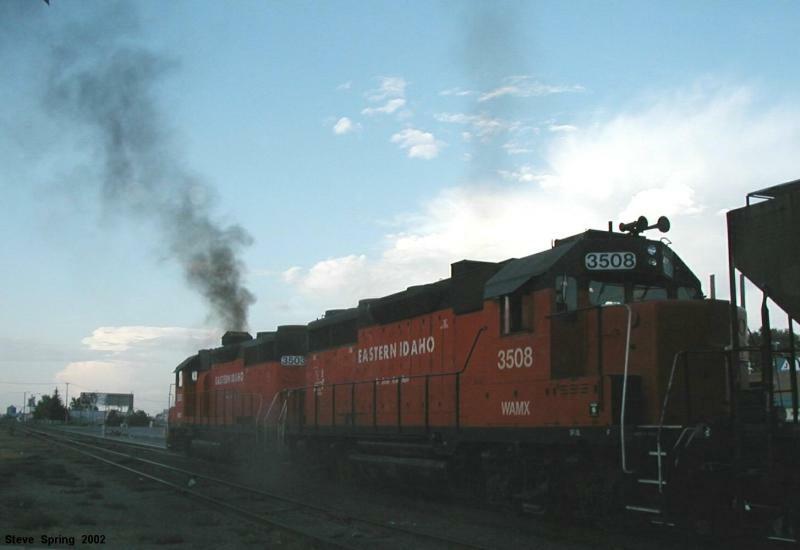 Like many short lines, Eastern Idaho Railroad's locomotives are made up of used locomotives. Many of these locomotives come from class 1 railroads, and have seen service in famous places, Horseshoe Curve and Feather River canyon being a few of them. EIRR stable of locomotives are made up of rebuilt GP9, GP38-2, GP40-2, and SD45 units. Some of these locomotives have been repainted into EIRR orange & black, reminiscent of the Milwaukee Road scheme, and labeled with slogan "the Snake River Route". Other locomotives remain in their previous owner's schemes and numbers, but with an "EIRR" stencil. 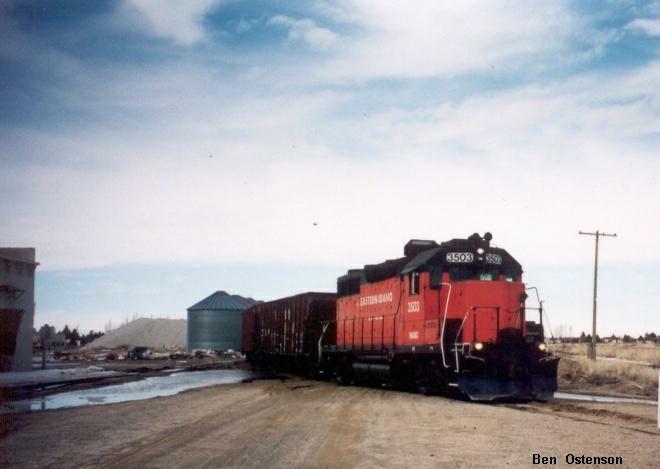 Some examples of this are Conrail's GP30 2242, and Bangor & Aroostook GP38-2 357 otherwise known as the "357 Magnum". EIRR 3503 & 3508 switching General Mills on the old main in Idaho Falls. Agriculture is the hot potato on EIRR; potatoes and grain make up the bulk of the traffic. 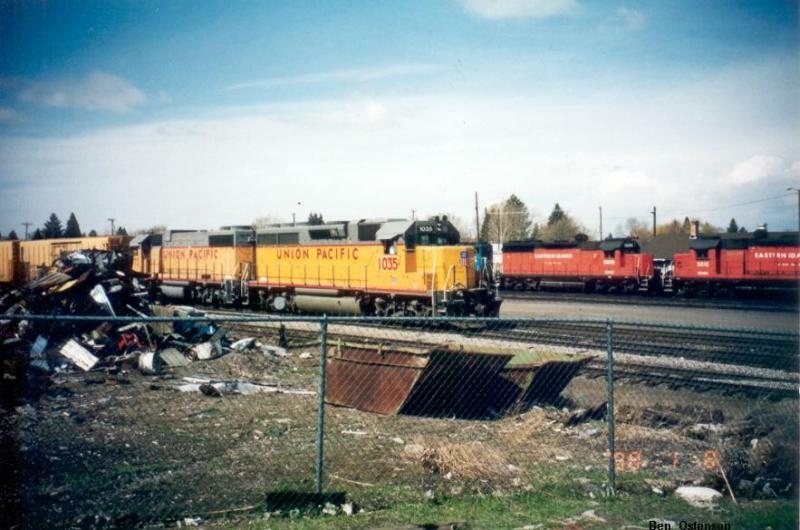 At times, the Idaho Falls yard is a sea of reefers and covered hoppers. EIRR is partnered with UP for potatoes, including UP's Express Lane perishables service. Reefer cars are of UP or SP origin, but UPs new "chilled express" cars are showing up more often. Twenty some odd spud houses on the northern segment keep EIRR on the go daily. 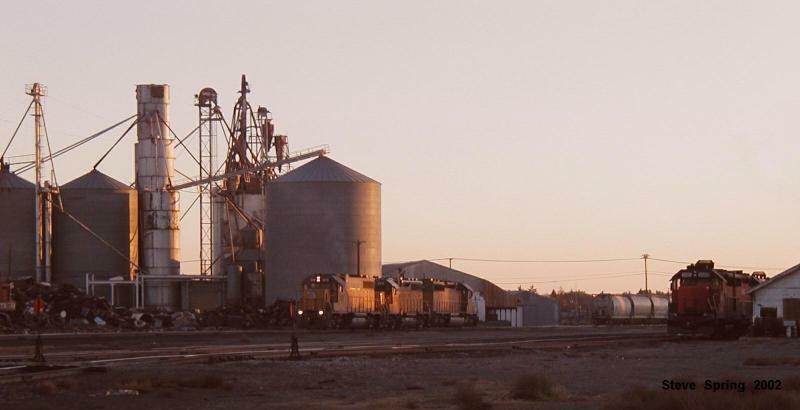 Grain traffic on the northern segment comes largely from the General Mills plants in Idaho Falls and Newdale. These two plants, at times, produce 50 car trains respectively. 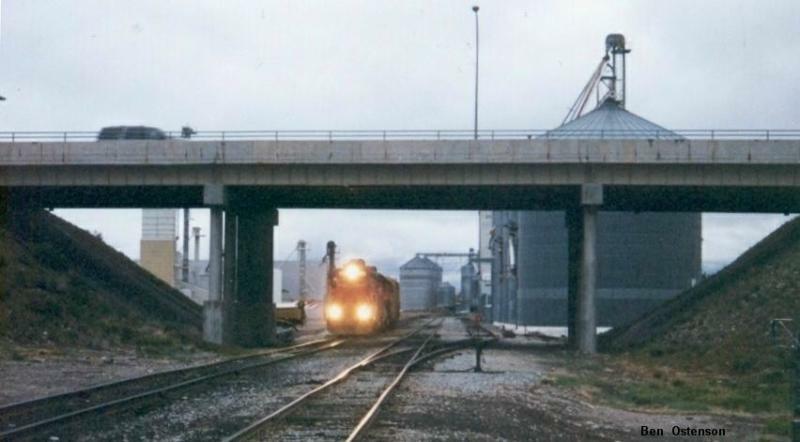 Smaller amounts of grain traffic are shipped from Ashton. Agriculture related commodities include fertilizer and herbicides. Non agriculture related traffic includes scrap metal, propane, aggregates, tar & asphalt. EIRR 3503 & 3508 switching General Mills near the Koch Tar & Asphalt plant. On occasion, there are up to two trains a day on the EIRR. 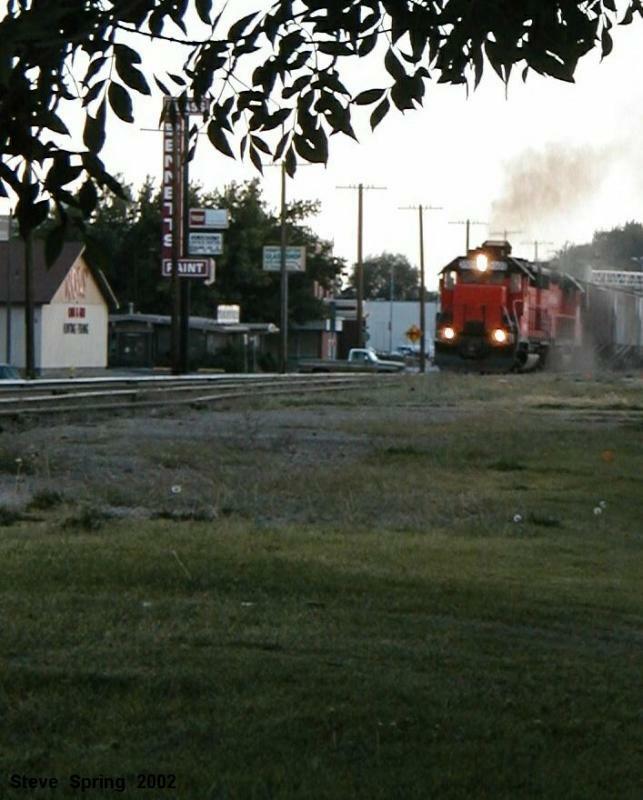 The Newdale Local, usually the first, leaves Idaho Falls after doing switching in the yard during the morning, then runs to Newdale and back. Every so often, the crew drops off cars before the switch to the Goshen branch, which it will switch on the way back. Afterwards, the crew will drop their train in the yard to switch the industrial tracks on the other side of the river in Idaho Falls. The next train is the Ashton Job, which leaves in the early afternoon. The Ashton Job switches the Menan and Egin branches on the way to Ashton and back. Occasionally, the two trains will just run as one going to Newdale, and then on the way back they will drop their train at Orvin and run up to Ashton, combine their entire train at Orvin, and then take the cars into Idaho Falls from there. Every so often, the EIRR will switch out an unit grain train for the Union Pacific at the General Mills elevator in Idaho Falls. 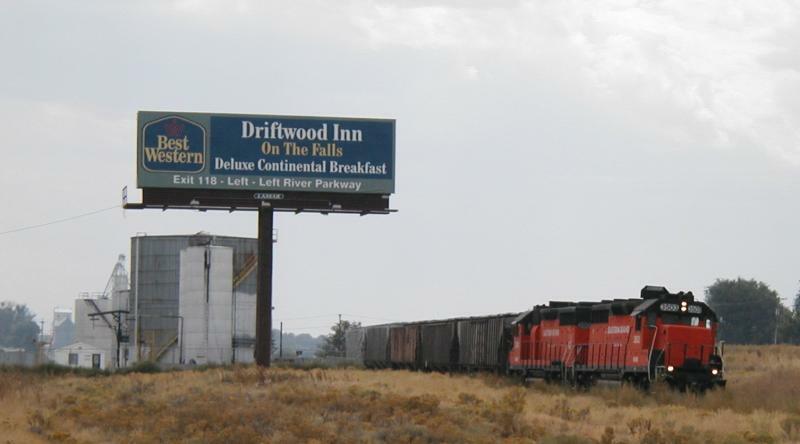 To this date (despite large blocks of grain cars switched out else where) this is the only unit train any one would be able to see North of Blackfoot, which 25 miles south of Idaho Falls. Also during the summer months, The American Orient Express is run to St. Anthony and back. This luxury cruise train takes passengers to Yellowstone and Grand Teton National Parks. These two trains are handled by the Eastern Idaho's crews as they are operated on their tracks. Uncle Pete 1035 heads north bound out of the Idaho Falls Yard. In the background is the EIRR loco service facility, and in the foreground is Pacific Scrap. Due to sparse vegetation, the Eastern Idaho Railroad should not be a problem to photograph. Though scenery plays a major part in capturing atmosphere of a train in action, your best place of all to take pictures would be the Newdale Branch. This branch offers many scenic features in which to capture the moment. One, for it's steep 2.2 percent grade out of Ririe, and two, for the particularly long 50 car trains that make a sporadic appearance coming out of Newdale, (typically grain cars). This branch offers action and excitement all in one as 50 loaded grain cars claw their way behind two GP35s. The Ashton branch can offer some excitement on the other hand. What makes this portion of the branch so exciting is watching trains on the Menan and Egin branches. The two small branches offer the look and feel of small time railroading. North of St. Anthony, the terrain becomes endless as the branch reaches the northern terminus of the once existent Yellowstone Branch. Eastern Idaho Railroad continues a traditions going on nearly a century -- it will reach the one hundred year mark in 2005. In 2002, the American-Orient Express luxury passenger train returned to the former haunts of the Yellowstone Special, Union Pacific's train to Yellowstone that was a rival to the Northern Pacific's Gardener train and on par with Santa-Fe's Grand Canyon.